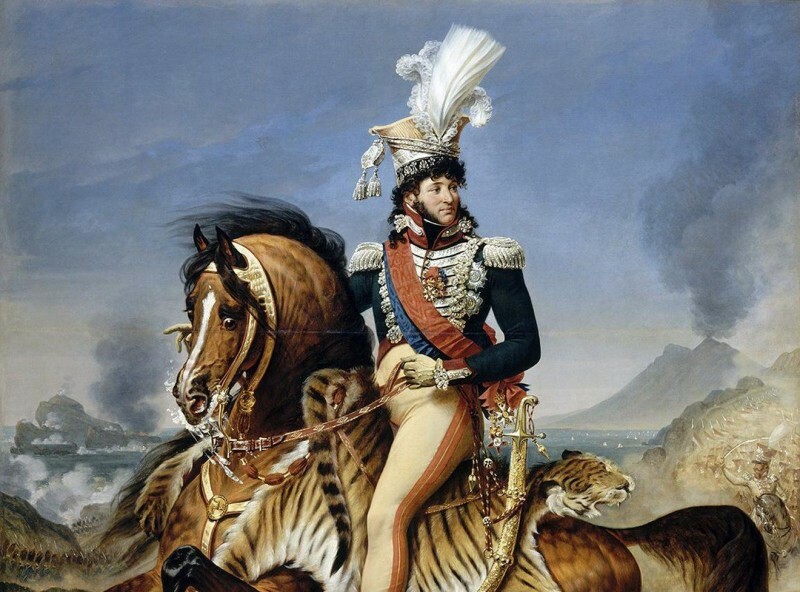 Marshal Joachim Murat became King of Naples, and also received titles of Grand Duke of Berg, Grand Admiral of the French Empire, and Prince of France. Napoleon’s Marshal Joachim Murat, the man whom Bonaparte showered with higher honors than any other associate, was born on this day. Namely, Murat was the only marshal that Napoleon elevated to a royal position. Murat became King of Naples, that is, he reigned over the southern part of the Apennine Peninsula (today the Italian regions of Abruzzo, Apulia, Basilicata, Calabria, Campania, and Molise). In addition, Murat heldthe titles of Grand Duke of Berg, Grand Admiral of the French Empire, French prince. He was also awarded the Grand Collar of the Legion of Honor. Murat was born in the small village of La Bastide-Fortunière in central France. He approximately belonged to Napoleon’s generation. Murat’s family wanted him to be educated for a priest, but he left the seminary and joined the cavalry. His rise began after he met Napoleon. Namely, in 1795 Bonaparte (then a general) took Murat for his aide. Murat was only a lieutenant in the cavalry at the time, but he proved to be an excellent officer. In a short time Napoleon elevated the capable Murat to the rank of general and commander of the cavalry. Murat’s cavalry was one of the key factors of Napoleon’s military success, because its fast maneuvers allowed it to pounce on individual enemy troops before they managed to merge and become a threat. After Napoleon came to power in France, he married off his sister Caroline Bonaparte to Murat. This made Murat a member of the family, and because of that he was awarded further honors and titles. It is interesting that Murat was also known as a dandy dresser (extravagance was at that time a common feature of cavalry officers).